Moving to a house where only the stairs and hallway are carpeted has meant I'm having to keep on top of cleaning our floors regularly. when you have a child you find yourself having to mop up spills etc more often. With this said it means we need a good mop to make sure our floors are clean. The JML Aqua Jet Duo Mop is the prefect multipurpose mop as its great for both wet and dry cleaning, due to its double sided micofibre mop head. 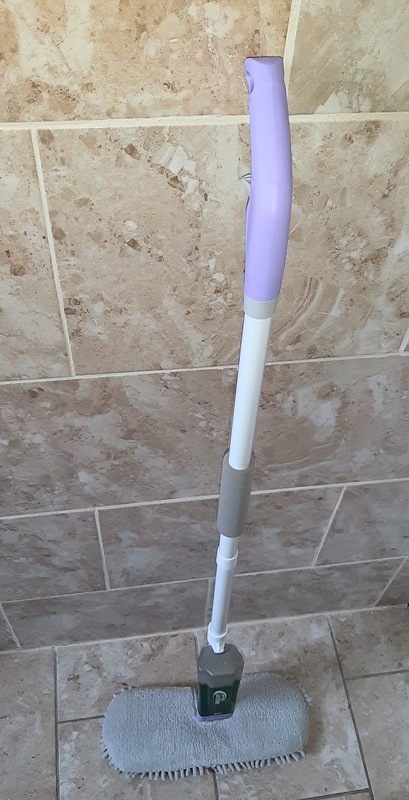 In an attractive light purple and grey design the Aqua Jet Duo has a built in spray bottle which holds up to 700ml of clean water so you can spray as you mop. Personally I prefer to add equal parts of floor cleaner and water so that I know my floors are clean and disinfected. This also means that I get a lovely fragrance in the room. I'm not a fan of bulky and heavy mops especially the idea of having to drag them up stairs. The Aqua Jet Duo is light weight and because of the built in spray bottle it means I've got the right amount of clean water right where I need it in front of the mop head. The double sided microfiber mop head are great at cleaning in different ways. The Terry weave microfibre is a dense, super-absorbent material that can absorb and hold up to SEVEN TIMES its weight in water, so it’s perfect for even the heaviest mopping tasks on hard floors like tiles, laminates, wood and even stone floors. Chenille weave microfibre, with its longer thicker fibres, creates a static charge, attracting dust as it moves across floors, shelves, door frames and windowsills, trapping not only the visible dust but also the invisible bacteria and even allergens. It's a handy mop for cleaning around the home. The built in spray bottle with the intergrated trigger on the handle is a great idea and works well. The dusting side isn't amazing but does the job.